Do you have a job interview coming up? I’m sure you have been researching and practicing the answers to possible interview questions. (At least I did for my first few interviews.) But are YOU prepared to ask a few questions yourself? I spent several years working in Human Resources, interviewing dozens of job applicants. At the end of every interview, I would ask if they had any interview questions themselves. Not only did this help the applicant learn more about the company and the possible job opportunity, but it also showed me that they were prepared and genuinely interested in the job. You want to find ways to stand out during the interview process. Prepare some questions to ask! Probing questions can help you identify whether this is a job that you are truly interested in. Below are some questions that I asked my potential employers, as well as questions that I was asked while conducting job interviews. 1.) Does this position have continued training and room for growth? If you are an ambitious individual who wants to advance within a company, you want to make sure that this position is not a dead-end. The answer to this question should clarify if and how long you will have to work and wait for a promotion. 2.) What is the biggest challenge someone in this role will face? You want to ask about potential challenges because this can uncover unknown aspects of the job description. Perhaps the previous employee had poor work ethic and left the next sucker with a bunch of catch-up work! Maybe the challenge is so great that you will experience work burnout and leave like the previous employee. Maybe the position does not pose enough challenge and will leave you bored and unfulfilled. Or, best of all, perhaps your particular set of skills may make you the perfect candidate to solve a company challenge. 3.) How is job-performance measured and reviewed? This is a very important question! I failed to ask this question during my first few interviews and regretted it. I never received a formal performance review and was never able to know which areas I was excelling in or needed to improve on. Asking this question will give you an idea of what you need to focus on and when to expect your first review. Bonus Tip: A performance review is a great way to showcase your dedication and work ethic – two things that often result in a pay increase. 4.) From your experience, what is the company culture like? This question may seem very vague, but it will give you some information on what type of company you may be working for. Is it a small, family-owned business? Is it a large, corporate institution or a government-run entity? Depending on your personality and preference, you may prefer a smaller company that has a more flexible policy manual. Or you pay prefer the large corporation, where policies and procedures are standard and unchanging. The answer to this question should clarify if their company has a culture you could see yourself thriving in. 5.) What do you like best about working here? This is a fantastic follow-up to the previous question! Perhaps they will give you a standard uninteresting answer, but they may give you a game-changing piece of information! They may tell you about the fantastic insurance benefits, award system, tuition reimbursement program, family-friendly atmosphere, or promotional opportunities. You are talking to someone who has firsthand experience of what it is like to work for the company – take advantage of the opportunity and ask! 6.) What is the next step in the hiring process? This question should be clarified during the interview, but it is sometimes skipped over. Make sure that you know what to expect after the interview is over. The interviewer should clarify if they will contact you for a second interview and when they expect to make a final decision. Follow this question by clarifying if they will contact you via email or phone. It should be their responsibility to let you know if you did not get the job. 7.) May I have your business card or contact information? Ask the interviewer (typically HR or your future supervisor) if you can have their contact information. This will ensure that you have a point of contact, so you can write them a nice thank-you note after the interview and follow up if you do not hear back about a hiring decision. BONUS TIP: Don’t ask about salary or benefits on the first interview! Wait until you are in the final stages of the interview process to inquire about and negotiate these terms. And yes, you can negotiate the terms of your salary and benefit package – especially if you are bringing experience to the table! There are many different interview questions that you can ask, but this should give you a good guideline of where to start! 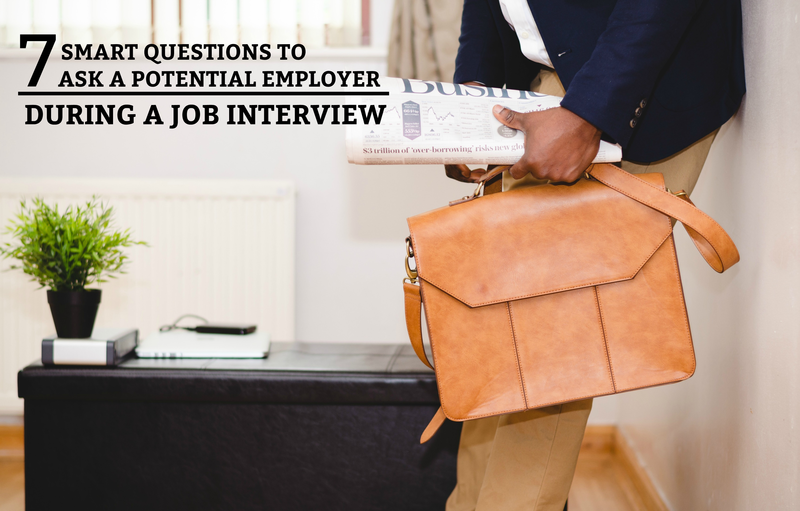 Regardless of what questions you have, make sure to ask at least three after the interview. Confidence and preparation will help you stand out in the crowd of potential employees.